One of the more popular booths I visited this week at Macworld Expo belonged to Bone@Fruitshop, a Taiwanese accessories maker. At first, the Bone booth appeared to be selling adorable figurines. Only an inch or two tall, each figurine is shaped like a cute creature that has been meticulously crafted out of some kind of squishy, durable substance—Pandas, dragons, and penguins smile cherubically at you. But then when you get closer, you realize that within each cute figurine is a 2, 4, or 8GB capacity flash drive. 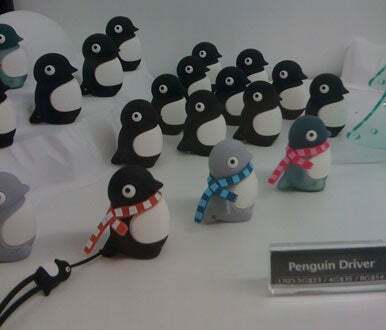 The Taiwanese company that makes these adorable flash drives was having difficulty keeping up with the sheer demand for its products. As one fellow attendee put it, these figures hide the USB drives so well, they’d be absolutely perfect for smuggling data across borders. After that, I could only view the giggling teen girls at the booth with suspicion. While Bone focuses on creating adorable and stylish flash drives, MimoBot offers limited edition designer drives with a geekier twist. 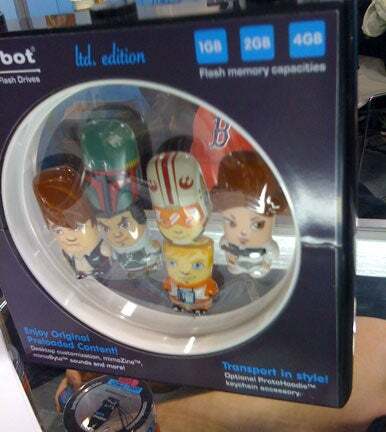 These drives are made into the shape of iconic characters from Star Wars, Halo, Domo, and Happy Tree Friends. Famous designers also lend their artistic talents to adorn the exteriors of these flash drives. Many of the drives come pre-formatted with content. The Star Wars series, for example, may have trailers, wallpapers, and sound clips of the character whose visage adorns the drive. A CP30 drive will make sounds like the droid when it is inserted into your computer. 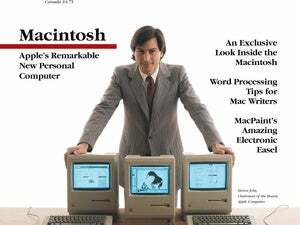 The drives come in 1, 2, 4, and 8GB capacities.